Portable device capable of diagnosing within ten minutes mild traumatic brain injury, using a single drop of blood. Every year in Europe, three million people are admitted into hospitals for suspected mild traumatic brain injury (mTBI) cases. Yet 90% of these patients will be able to return home safely, as no trauma has been detected. Today, the only reliable diagnosis is the CT Scan, which is only available in some hospitals and, in addition to being expensive, exposes patients to radiation. Researchers from the University of Geneva (UNIGE), in collaboration with the Hospitals of Barcelona, Madrid and Seville, have developed a small device -- Point-of-Care Test (POCT) -- that analyzes the level of proteins in the blood and allows, using a single drop of blood, to diagnose the possibility of a mild traumatic brain injury. This discoverymwill not only relieve emergency departments, free patients from often long waits, but also save on costly medical examinations. "We wondered if it was possible to isolate certain proteins whose presence in the blood increases in the event of mild traumatic brain injury," explains Jean-Charles Sanchez, professor at the Department of Internal Medicine of Specialties and the Biomarkers Centre of the Faculty of Medicine of the UNIGE. "Our idea was to find a way to do a quick examination that would allow, during a boxing or American football match for example, to determine whether the athlete can return to the field or if his condition requires hospitalization. The opposite of the CT Scan, an exam that lasts a long time and cannot be done anywhere," he adds. It was still necessary to develop a device that could be used everywhere, quickly and simply, and that could be available in pharmacies or sports halls. "When a person has an accident in the mountain, few practices can do a CT Scan," notes the Geneva researcher. 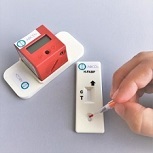 His team has developed a rapid diagnostic test (POCT) called TBIcheck, inspired by the principle of pregnancy testing: by placing a single drop of blood on the well of a small 5cm plastic case, the patient knows within 10 minutes whether there is a risk of mild trauma, namely whether or not his H-FABP level is higher than 2.5 nanograms per milliliter of blood. "If a lane appears, the injured person must go to a hospital for a CT scan, if there is nothing, he can go home safely!" Jean-Charles Sanchez says. In case of doubt when reading the result, a small reader, the Cube Reader, can be installed on TBIcheck. It will display the word "positive" or "negative" and send the result to the patient's or caregiver's smartphone via Bluetooth. No more doubts! Illustration: One drop of blood is enough for TBIcheck to diagnose a possible mild brain trauma. If a line appears below the control line, the injured person will have to go to the hospital for a CT scan. Credit: © UNIGE.